The World Radiocommunication Conference 2015 (WRC15) is currently underway in Geneva. The WRC started 2 November and will conclude 27 November. Consensus has developed around a new 15 kHz-wide global secondary 60 meter Amateur Radio allocation at 5351.5-5366.5 kHz. 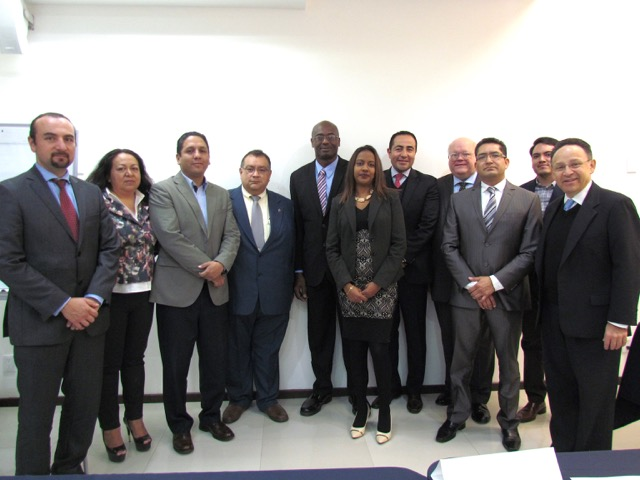 Last week, Conference Working Group 4B agreed to the global secondary allocation, with power limits designed to protect primary services from harmful interference. The current compromise within WG4B making the allocation possible has also cleared Committee 4 but must clear one more level at the conference. The issue is not final until it does. At the beginning of the WRC, a number of administrations and the regional telecommunications organization (RTO) representing Russia and 10 of its neighboring countries (RCC) were strongly and actively opposed to the new amateur allocation. After more than a dozen sub working group meetings, it became clear that the widest achievable allocation was 15 kHz and that a power limit in the neighborhood of 15 W effective isotropic radiated power (EIRP) would have to be part of the package. “It took all the effort and resources of the entire IARU-team to ensure this 15 kHz compromise and to persuade some administrations to abandon their no-allocation position,” said IARU Vice President Ole Garpestad LA2RR. The International Amateur Radio Union WRC Team is headed by IARU President Tim Ellam VE6SH and Vice President Ole Garpestad LA2RR. In addition, the following amateurs were a part of the IARU WRC Team: Reinaldo Leandro YV5AM, President of IARU Region 2 and Faisal Al-Ajmi 9K2RR, Vice President of IARU Region 1. A number of other amateurs were part of the IARU WRC Team while serving on a national delegation: Colin Thomas G3PSM, Hans Blondeel Timmerman PB2T, Ken Yamamoto JA1CJP, Bryan Rawlings VE3QN, Tafa Diop 6W1KI, Don Wallace ZL2TLL, Dale Hughes VK1DSH, Flávio Archangelo PY2ZX, Ulrich Mueller DK4VW, Brennan Price N4QX and Jon Siverling WB3ERA. IARU hosted a small reception at the WRC on November 10 which was attended by a number of delegations and ITU senior leadership including ITU Secretary General H Zao. Attending the reception and participating in part of the WRC were IARU Region 1 President Don Beattie G3BJ and Dave Sumner K1ZZ. Sumner attended on behalf of the IARU International Secretariat. IARU made arrangements for an emergency communications trailer to be on site during the first part of the Conference. IARU International Coordinator for Emergency Communications Hans Zimmerman HB9AQS/F5VKP worked with IARU member society DARC and NOTFUNK Deutschland to provide for a communications trailer and antenna system that showcased amateur radio emergency communications abilities and was located in a high traffic area at the Conference facilities. Zimmerman was on site to explain the use of amateur radio to delegates. The IARU team continues to follow a number of agenda items which may impact the amateur services especially a possible WRC-19 agenda item for an allocation to accommodate small non-amateur, non-geostationary satellites. A later news release will be distributed at the conclusion of the WRC. 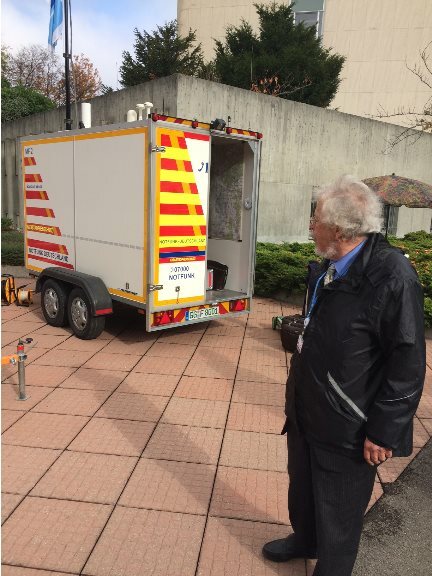 The photo attached below shows IARU International Coordinator for Emergency Communications Hans Zimmermann HB9AQS/F5VKP observing preparations for the emergency communications display at WRC15 in Geneva.